Persavita is excited to offer you three eye supplements to meet your specific vision health needs. Freedom To Choose. Freedom to See. We are now providing you with three supplement options so you can have the freedom to choose based on your ophthalmologist’s recommendation and/or by taking into consideration your unique allergies or intolerance to certain ingredients. For Eye Health, Look No Further! It is possible that your body is sensitive, or you may have a known allergy to vitamin E or vitamin A. You may just prefer to stick with what is working for you, or you may prefer to take moderate levels of vitamins and minerals. The choice is yours… three saffron supplements to choose from! With the same daily quantity of vitamin C, vitamin E, zinc and lutein as the leading supplements that were tested in the NIH study. Saffron 2020-XP is a new supplement that combines the benefits of saffron with antioxidant properties from high levels of vitamins, lutein and zinc. If for any reason you want to take the maximum daily dose of vitamin C and vitamin E plus our highest daily dose of zinc (25 mg), you do not need to look further: choose Saffron 2020-XP. Warning: Saffron 2020-XP contains high quantity of vitamin E. Do not take this supplement with other eye supplements (such as AREDS formula) that contain vitamin E.
For those who do not want to take high levels of vitamins and zinc. Persavita’s first patented eye supplement with saffron. For over nine years, Saffron 2020 has been helping people affected with age-related vision changes. Saffron 2020 contains resveratrol at a daily dose of 100 mg; the highest dose of resveratrol among our saffron supplements. Saffron 2020 is the only product that contains 100 mg resveratrol with 20 mg saffron, a combination with synergistic properties. For those who choose to personally manage the daily intake of vitamins and minerals from other supplements. Provides eye benefits of saffron. 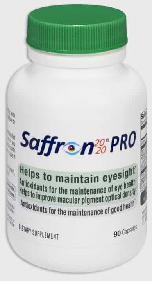 Saffron 2020-PRO is for those who use other eye supplements and want to complement them with the power of saffron and resveratrol. 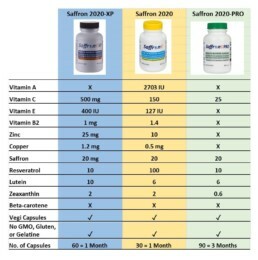 Choose Saffron 2020-PRO if you have known allergies or intolerance to vitamin E or vitamin A. Have you been told not to take vitamin A or vitamin E supplements? For a high quality saffron supplement, choose Saffron 2020-PRO. No matter which product you choose, you are assured that all products consistently deliver 20 mg daily dose of the highest quality saffron. 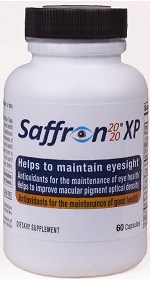 Our saffron vision supplements are made to help you maintain your eyesight over the years. Cautions and Warnings: Do not exceed the recommended dose. If you are taking other supplements or prescription medication, consult a healthcare practitioner prior to use. If you are pregnant or breastfeeding, consult a healthcare practitioner prior to use. Consult a healthcare practitioner prior to use if you have cancer, cardiovascular disease or diabetes. Do not use if you are allergic to plants of the Asteraceae/Compositae/Daisy family. 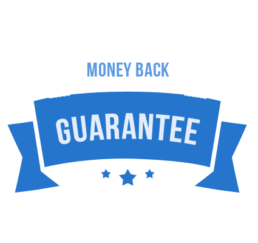 We back up our products with a full money-back satisfaction guarantee. Our macular degeneration supplements are developed by a licensed pharmacist based on peer-reviewed scientific findings including clinical studies. We guarantee that once you try our products for three months, you will be satisfied with the results. If within 90 days of your first purchase you are not satisfied with the results, or if you don’t see results we will refund your money including your shipping charge, 100% guaranteed. You depend on your eyesight. Now you can depend on Saffron 2020 to help preserve it. Your eyes are for life, act now for your long-term vision health. Supplements for eye health (macular degeneration & cataracts). Persavita creates innovative, science-based nutritional supplements for the aging population. We back up our products with a full MONEY-BACK SATISFACTION GUARANTEE. © 2018 Persavita, Inc. *These statements have not been evaluated by the Food and Drug Administration. These products are not intended to diagnose, treat, cure or prevent any disease. The information on this website is not intended to replace a one-on-one relationship with a qualified health care professional and is not intended as medical advice. It is intended as a sharing of knowledge and information. We encourage you to make your own health care decisions based upon your research and in partnership with a qualified health care professional. If you are pregnant, nursing, taking medication, or have a medical condition, consult your health care professional before using products based on this content. Individual customer results may not be typical.